HORACE GREELEY. 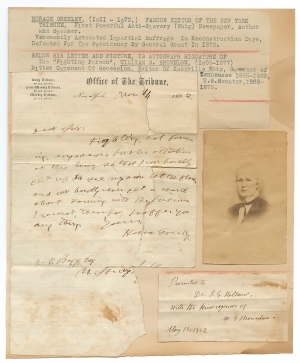 Autograph Letter Signed to J. N. Bagg, November 11, 1862. 1 p.
New York, Nov. 11 1862. Fighting, not farming, engrosses public attention at this time, so that I can hardly get up to see my own little place, and can hardly ever get a word about Farming into The Tribune. I cannot, therefore, proffer you any thing. In 1853, Greeley purchased a farm in rural Chappaqua, New York, as a summer home for his family. But the thirty-mile trip on the New York and Harlem Railroad took over two hours, so his comment about the difficulty of getting up “to see my own little place” was certainly understandable. In the summers, Greeley experimented with farming techniques which he wrote about in a weekly column in his paper. He spent much time and money trying to make the farm productive, erecting a stone dam on a brook, and unsuccessfully attempting to drain marshy lowland to prevent flooding. In 1857, Greeley also built an innovative concrete dairy barn, which still exists. Horace Greeley (1811-1872) became a printer’s apprentice in 1826. He moved from New Hampshire to New York City in 1831. After a campaign newspaper he published in 1840 gained a circulation of 80,000, Greeley founded the daily New-York Tribune in 1841. By the end of the 1840s, the paper’s weekly edition had a national influence. Greeley urged the settlement of the West, and he supported the abolition of slavery, which led him to the new Republican Party in the 1850s. He died in 1872 a few weeks after losing his presidential bid against Ulysses S. Grant on both the Democratic and Liberal Republican tickets. James Newton Bagg (1824-1905) lived in West Springfield, Massachusetts for most of his life. In 1850, he was a clerk, still living with his parents. By 1860, he was a farmer with $2,000 in real estate, and lived with his wife, daughter, and aged parents. Bagg was secretary of the Hampden Harvest Club and 1862, became secretary of the Hampden County Agricultural Society. In 1874, he compiled an account of West Springfield’s centennial celebration and served as postmaster from 1895 to 1900. Tears, loss of bottom right corner with loss of some text of inside address. Pasted on page with cropped vintage carte-de-visite size photograph of Greeley.